I received a text message last week from my buddy Phil. Well, technically it was just a picture of a very clean G2 Legend coupe. “Yours? !” I responded. Indeed, Phil responded that he had snagged his “new” car from the son of its original owner just a day prior. It came with an impressive stack of maintenance records and a clean history. Score! Phil and I got together on Friday afternoon to get a few photos of our Legends together. 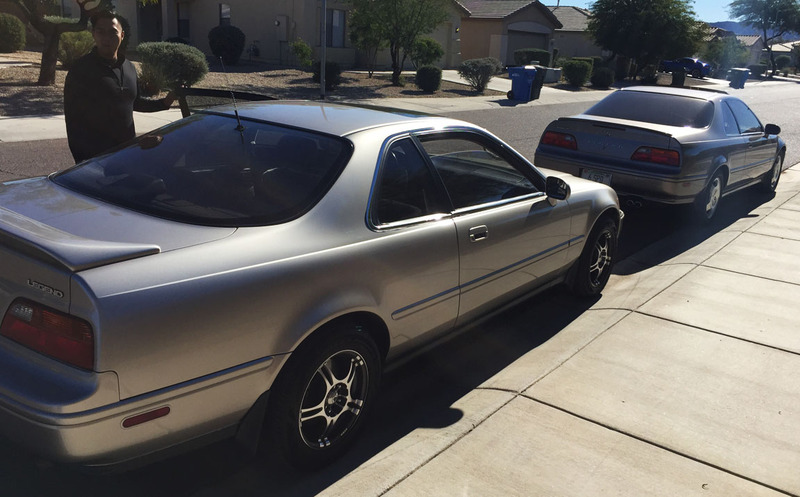 These two cars, by the way, added up in mileage to a whopping 802,595 miles combined. The front end of Phil’s car is in remarkable shape. The whole vehicle received a professional respray not long ago. It’s also now protected with a Clear Bra. Wheels are aftermarket 15″ Konig units, but Phil is thinking of sourcing a set of the correct OEM alloy 7-spokers. How many bugs have these two cars collectively killed over their lifetimes? Phil’s Type I powerplant still looks nice for having over 270,000 miles on it. Gotta love that factory spoiler. Phil’s car also has the accessory cellular telephone in the center console. 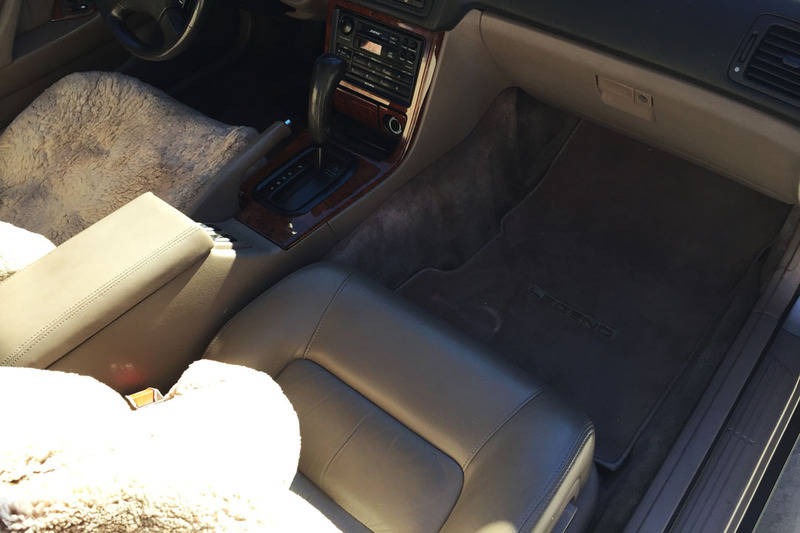 Seats are in remarkable shape thanks to having been covered by sheepskin covers. 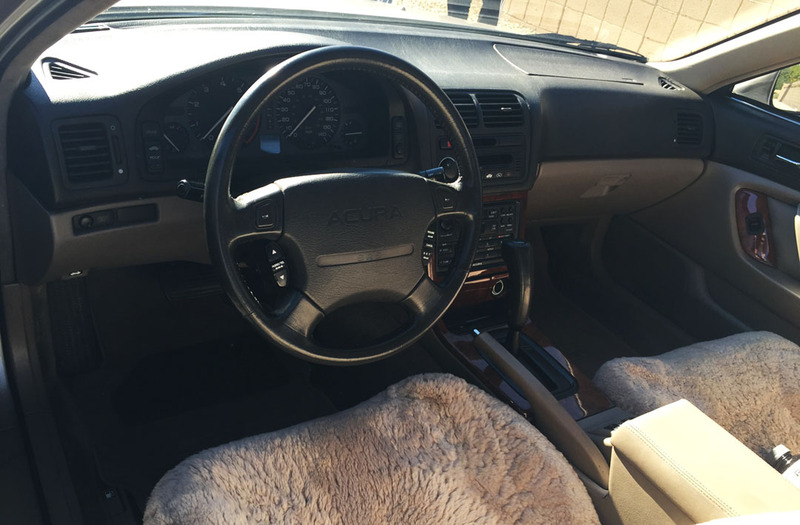 Just check that passenger seat out! Congrats, Phil, and welcome to the family! This entry was posted on December 30, 2014 at 8:22 am and is filed under Legend, Reader's Ride. You can follow any responses to this entry through the RSS 2.0 feed. You can leave a response, or trackback from your own site. Congrats to Phil! At first I thought I was seeing double, but it’s good to see another Legend coupe of that vintage in such great shape. 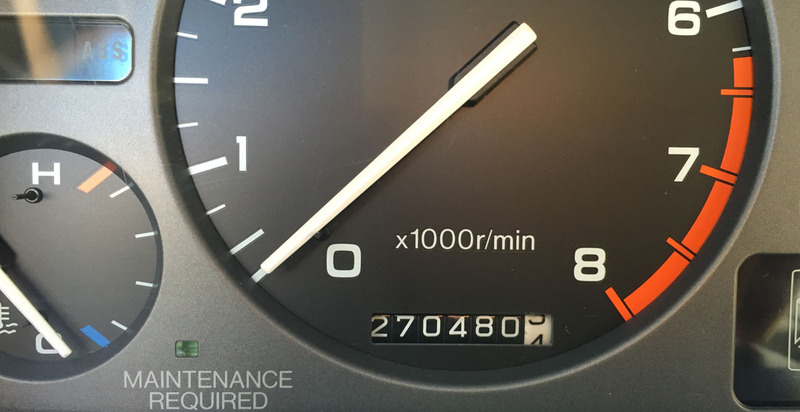 At only 270k, we know that car has at least another couple hundred thousand in it with good maintenance! Double vision is a good thing when it relates to seeing a couple of nice Legends! I’ve assured Phil that his Legend is still a newborn with those miles. Happy new year, Brad! How come the “Legend ” badge on your Legend and Phil’s Legend are in different locations? Hi Farid, that’s a difference between model years. 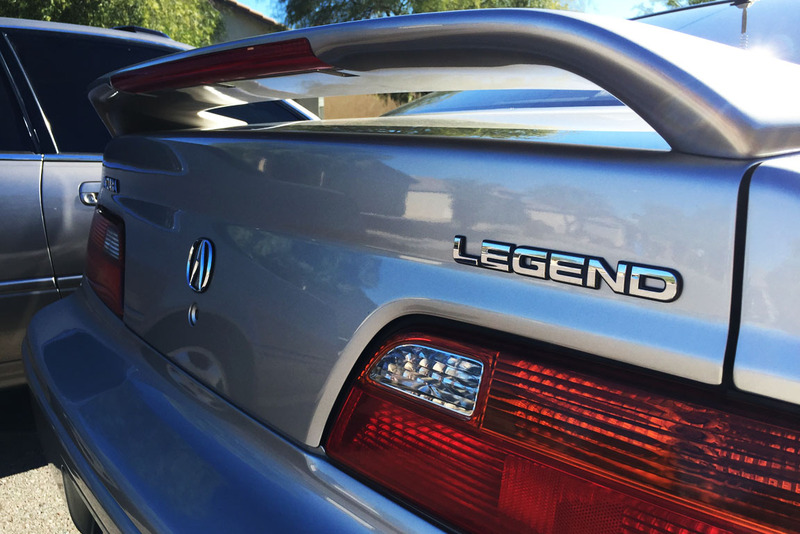 From 91-93, the Legend badge was at the top right corner of the trunk lid, and from 94-95, it was spelled out in the center of the trunk lid. Happy New Year Tyson! Another nice article. I got a quick question, which synthetic oil would you choose out of these 3: Honda Ultimate Synthetic (made by Conoco Phillips), Mobil1 Extended Performance, or Castrol Edge Titanium? I’d do the Mobil 1 just because I’ve heard so many good things about it. I’ve never used any of those three, though. Happy New Year to you, too! What do you use? I saw your video a week back (YouTube interview). Nice! Castrol GTX is what million mile Joe uses, and he has been using that since the early 1980s. Tyson, any idea how the Michelin Premier A/S’s perform? Unfortunately, Michelin is discontinuing the Primacy MXV4’s, which have provided me with a nice quiet ride. The tread on the Premier A/S’s starts at 9/32nds. two very nice vintage Legends! Nice score Phil! Agreed – he did well on this one! Sounds like he’s really having some fun with it. Nice to see a Legend end up in worthy hands.